We are two longtime teachers in the Los Angeles Unified School District and native Angelinos who love to discover the hidden gems in our favorite city. We set out to interview people we consider to be local heroes behind our favorite places and events, and bring you stories of those who contribute beauty, steward nature, share their culture and inspire us. 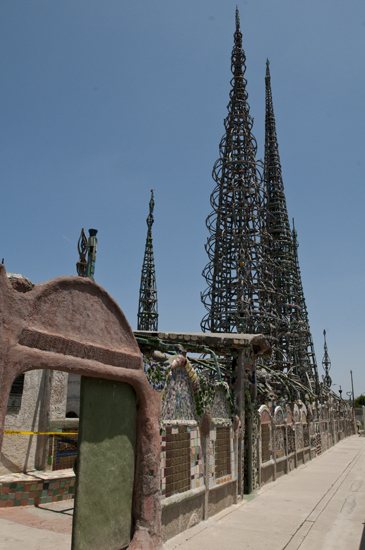 The legendary Watts Towers are 90-foot sculptures built by Italian immigrant Simon Rodia working alone for 33 years, at night and on weekends. He did not finish until 1954, when he left the neighborhood and never returned. He used rebar, concrete, glass, broken pottery, seashells, and what we would call today, "recyclables." Despite earthquakes, riots, and neglect, the lacy, open structures have survived. The delicate and stunning towers have become an inspiration and a rallying point for artists, musicians, neighborhood activists, and students. Today the towers are a landmark of our city, and are curated by the Watts Towers Arts Center under the umbrella of the Los Angeles Cultural Affairs Department. The Center offers programming and workshops including annual jazz and drum festivals, an art gallery, and classes for students. The artistry that began at the tower has now expanded beyond the Center and Towers. 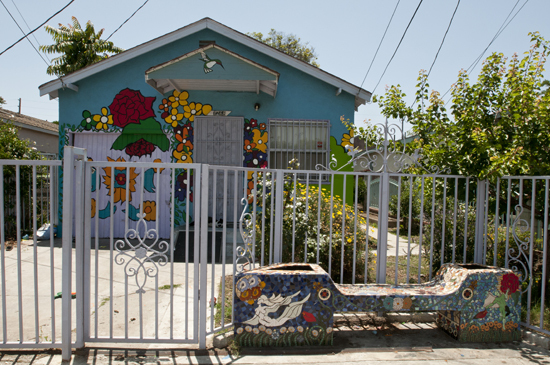 Visitors can spot a mosaic bench, wrought-iron fences, gardens, and other beautification that the Watts House Project is bringing to the small houses directly across the street from the Towers. 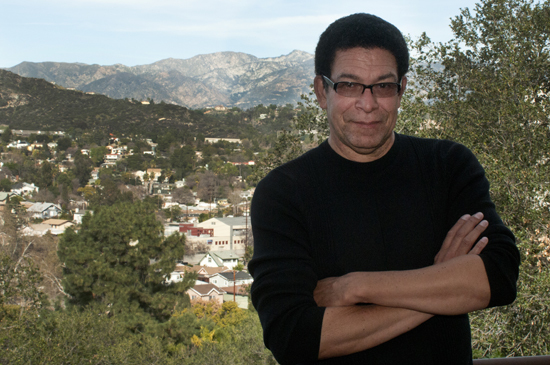 Mark Steven Greenfield directed the Watts Towers Arts Center for nine years. We sat down to talk with him about the Towers and misconceptions surrounding the Watts neighborhood, the positive impact of the Center on today's youth, and his own work as an artist. Q: Why should children visit the Watts Towers? MSG: I want children to see the Towers to jump-start their imaginations. I want them to leave thinking that anything is possible. Q: Why is it difficult to get people to leave their comfort zones to visit the Towers? MSG: Most people have the impression that the area around the Towers is very dangerous. In reality, this is not true, and anyone who avoids going to the Towers out of fear is missing a potentially life-altering experience. Q: Why did you start working for Cultural Affairs? MSG: I wanted to escape the police department, where I had been working as an artist. As a teenager, I got in a lot of trouble; I believed in the back of my mind that the police hired me to keep an eye on me. Q: How did you see your contribution to the Watts Arts Center? 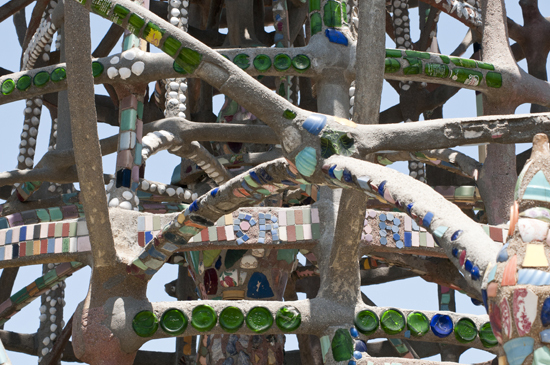 MSG: Anybody who works at Watts Towers has a sacred trust. My job was as custodian of the towers, to protect them and the people in the community associated with them. I had to dispel negative things said about it -- the community has been vilified and some of it is undeserved. Guests at some large L.A. area hotels wanted to visit the towers, and the concierges would say, "Don't go down there, you'll get hurt. " I contacted the heads of some of the large hotel groups and demanded a meeting to talk about how what they said impacted the community, because it was wrong. Q: How do the Towers bring the community together? Q: What works in Watts? MSG: I was successful with the children's programs especially as public school arts funding was cut. Teachers would come over from Markham Middle School and tell me that the kids who got engaged with us in art became more successful; art built self-esteem, built connections between kids in gangs... but not every kid there is in gangs. The outside perception is that if you see six kids together, there's got to be a gang. Q: What was the biggest challenge? MSG: Changing the perception of youth in that community is a daunting task, and all of us on staff made a daily effort to do that. We'd get calls from Stanford -- 'We want to know how many of your kids are ex-drug users, gang members.' I don't get in their business like that, I am going to defend this perception and turn it around some way one person at a time. Q: What should people know about Watts? MSG: Don't prejudge, understand that it's a neighborhood in many ways like yours -- at the same time unique with its own set of problems, and those problems don't have to become yours just because you are there. Maintain respect. When you go to a neighborhood be mindful of the fact that you are a guest, and you have to adapt. We've brought in college students to run programs, and there was resistance because they came in like missionaries. I had to explain missionaries get boiled and eaten. Q: How do you feel about working with community? MSG: I was inspired by Rick Low, who started the Project Row Houses in Houston. He believed that working with people in community had become his artistic practice. So I realigned myself to think in those terms, and the job took on a different satisfaction for me. You are creating an art piece with a much longer lasting effect than anything you can put on somebody's wall. Q: What do you hope your legacy has been? MSG: I hope that my tenure at the Towers would be seen as an effort to change lives, inspire creativity, address the changing demographics of the community and the city at large, and promote awareness of the Towers as an international treasure. My self-proclaimed mandate was inclusion and accessibility, and I feel I was successful. Q: Can you tell us about your own art? MSG: I address racial stereotypes in my work. It's very therapeutic from the standpoint of the African American community -- we bury these images out of self-preservation, but by not engaging with them, we allow them to have power over us. You can't remove the power from something you don't acknowledge. I don't throw these images up so I can be a bad boy, but to stimulate the type of dialogue that often people avoid because they don't want to discuss it in polite company. 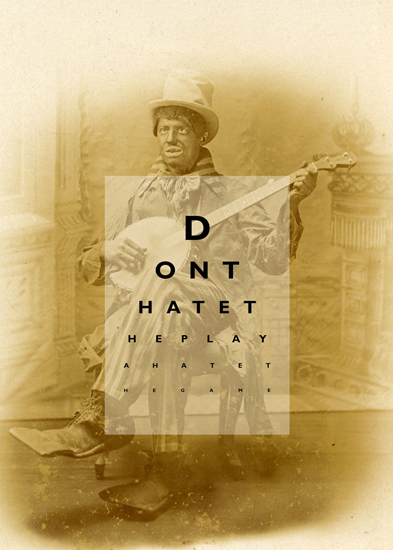 But by avoiding, you perpetuate. The Watts Towers of Simon Rodi are located at 1761-1765 East 107th Street, at a Metro Blue Line stop. Use their website to arrange a field trip or tour. To contact the Watts Towers Arts Center and Charles Mingus Youth Arts Center, click here.